MindManager is an incredibly versatile and useful program but it has its shortcomings, so I thought I’d start an occasional series of articles on how to overcome some of these. Many of these posts are based on solutions I’ve suggested in response to questions on the Mindjet community forum. Welcome to the first in the series, on selecting topics by level. UPDATE: I’m very pleased that this feature has been added to the latest version (3.8) of the MAP add-in from Olympic Limited. This has a wide range of features that I’ll be reviewing shortly, but it offers a simpler way to access topic selection than using WordX2 (which obviously has other uses). One of the puzzling aspects of MindManager is the lack of any provision to select topics automatically at the same level across branches. Apart from Main Topics (which I will come to in moment), MM does not appear to offer an easy way to do this – or at least none that I can find. MM obviously “knows” about its own topic levels – it automatically allocates the appropriate level whenever you add a topic or sub-topic. In addition it also matches the topic level to the relevant heading or paragraph style based on the template used when a map is exported to Word; this information is also available to third-party add-ins. However MM does not extend this facility to end users, despite the many other selection options provided. Topic level selection is not provided as an option for filtering or searching, nor can it be used as a trigger in conditional formatting or as a range in formulas. The only “official” ways to select topics (besides Main Topics) at the same level manually are using the shift or control keys, or highlighting them with the mouse. This is frustrating as there are many situations in which the ability to select by topic level throughout a map would be very useful, for example, if you want to quickly change the appearance of a whole layer of topics or to add an icon or tag to them. It would also be helpful to be able to specify topic levels in formulas, so that you could sum or average a numeric topic property at the same level across branches. I don’t know why MindManager’s creators have made this so difficult, but I can suggest a couple of workarounds to make topic level selectable. The first one which applies only to Main Topics is more of a neglected command than a workaround, while the second can be easily applied at any topic level but requires the use of an add-in. As I noted earlier the Main Topic level is the only one directly selectable in MM. Simply click on any Main Topic, then click on the Select tab under the Advanced ribbon and then click Select Siblings. All the Main Topics will be highlighted (you can also use the keyboard shortcut Ctrl+Shift+A). This works because all Main Topics are siblings of each other with the one “parent” – the Central Topic; try this on a sub-topic and you will only highlight the other subtopics at the same level within the branch. The second approach makes any level of topics selectable but requires an add-in from Olympic Limited. For once I’m not talking about Olympic’s flagship product, the wonderful MAP, but rather their Word export add-in, Word X2. This provides a much more customisable approach to exporting to Word compared to MM’s built-in facility, which also means that topic level can be accessed relatively easily. First you obviously have to purchase and install WordX2, then follow the add-in’s set up instructions on how to add and apply a Word template. After the template is applied every topic in the map should have a WordX2 “W” icon. Click on any topic at the level you want to highlight. On the WordX2 tab the first field should be showing the applicable Word heading style; Header 1 for Main Topics, Header 2 for the first layer of sub-topics and so on. Click on the four-box icon to the right of this field to select all topics at the same level (if you hover on this icon first you should get a WordX2 tip to this effect). At this point every topic in the map at the same level should be highlighted. Normally in WordX2 you would make some adjustments (for example, changing the Word style to be applied) and then proceed with the export. However, all MAP’s commands are available at this point and you can for example apply topic formatting, add icons and generally do anything else which MM permits you to do to selected topics. After this you can proceed with a Word export but you don’t have to. If you want to retain the export settings but you don’t want to see the WordX2 icon you can hide it. You can also remove the icon from individual topics, specific topic levels or the whole map, which of course also means these topics won’t be exported. Next up: how to apply and use “secret” markers. 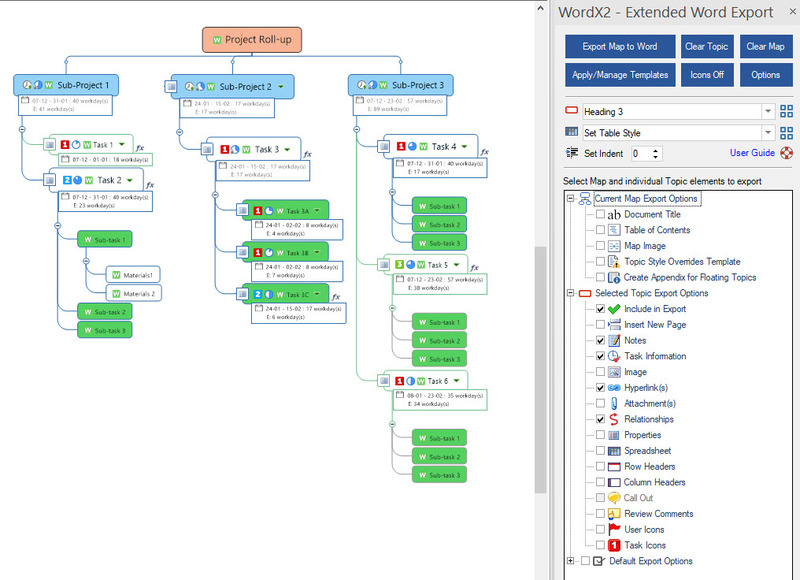 This entry was posted in Mind Mapping, Shortcut, Viewing, Filtering and Formatting and tagged Mind Mapping, MindManager. Bookmark the permalink.